According to John Goodwin, who says he uses a theratest machine in his work as an "Isopathic Practitioner," this device is "a highly sophisticated bio-electrical machine that functions by measuring minute electrical impulses that travel throughout the body meridians via the acupuncture points found on the skin surface. "* Goodwin says the theratest machine can detect toxins in the body by measuring the aura or energy field of the toxins. (He then develops homeopathic remedies from the toxins and promises to completely detoxify anyone who comes to him for treatment. *) Goodwin believes that poisons, bacteria, and viruses emit specific auras detectable by the theratest machine. I don't know if I would trust Goodwin about energies and auras, however. He thinks auras are created by the life force in any living thing and says "In medical science they can pick up the subtle energy within the body on a cardiograph or brain graph." No, Mr. Goodwin, that's not true. Scientists gave up the belief in a life force, known as vitalism, over a century ago. The electrical impulses measured by an electrocardiogram are the result of chemical and physical activities in the heart. An electroencephalogram measures and records the electrical activity of your brain. My guess is that Mr. Goodwin and others who use the theratest machine are measuring electrical activity at the surface of the body (hands and feet are where these folks say they do their measuring of the life force). In short, the machine is essentially a galvanometer used inappropriately as a medical device. One might as well use a dowsing rod or a crystal attached to a car battery. Thousands of years ago, it was discovered that energy travels in lines along the human body, and modern technological methods using electronics, thermography and radioactivity, have actually been able to measure and map these lines. Along these lines are various points which have unique electrical characteristics which distinguish them from the surrounding skin. It is onto these very specific electromagnetic points on your hands and feet that I place the electrode of the Theratest Machine and am thereby able to determine the state of various organs e.g. the liver, heart, lungs, stomach etc in your body. A point which requires treatment is often tender and has a low electrical resistance. This method of diagnosis is very accurate and I am able to use the energy reading that the machine gives to discuss genetic influences, organs that are energetically low and can often predict an illness before it actually occurs. Abrams called his healing method radionics and claimed that he was able to detect distinct energies or vibrations (radiation) being emitted from healthy and diseased tissue in all living things. He invented devices that allegedly could measure this energy (vibration, radiation) and he created a system for evaluating vibrations as signs of health or disease. Despite the fact that there is no history of scientific validation for the claims that sick organs give off particular vibrations, radiation, auras, or the like, or that any device can both measure and heal by detecting and emitting vibrations, electrical impulses, radiation, etc., belief in energy medicine continues to flourish. The first EAV devices were developed by Reinhold Voll, a West German physician who had been engaged in acupuncture practice in the 1950s. In 1958, he combined Chinese acupuncture theory with galvanic skin differentials to produce his EAV system. His first transistorized model was the Dermatron. A few years later, one of his students (another German physician named Helmut Schimmel) simplified the diagnostic system from approximately 850 points to 60 points, made small modifications to the equipment, and went on to help create the first model of the Vegatest. Subsequent variants include the Accupath 1000, AcuGraph, Asyra, Avatar, BICOM, Bio-Tron, Biomeridian, Computron, CSA 2001, Diacom, DiagnoMètre, Eclosion, e-Lybra 8, ELAST, Interro, Interactive Query System (IQS), I-Tronic, Kindling, LISTEN System, MORA, Matrix Physique System, Meridian Energy Analysis Device (MEAD, MSAS, Oberon, Omega Acubase, Omega Vision, Orion System, Phazx, Prognos, Prophyle, Punctos III, SpectraVision, Syncrometer, Vantage, Victor-Vitalpunkt Diagnose, Vistron, Vitel 618, and ZYTO. Scientific testing of these devices is never done by the practitioners who use them. They take it on faith, I guess, that the machines work as marketed. Anyway, a group of British researchers tested one such device--at the time (2001) there were more than 500 such machines in use in the UK--and found it worthless for detecting allergies. This should have come as no surprise since the machines are just fancy galvanometers hooked up to software programs that spit out diagnoses and treatments on par with machine-generated fortune cookie and newspaper astrological readings. This would be funny if it weren't so dangerous. See also energy medicine, radionics, and vibrational medicine. Listen to My Story - Cheryl Freeman exposes more dangerous devices masquerading as medical diagnostic and treatment instruments "In 1996 I became filled with horror at the thought that an unborn baby in Australia could become infected with HIV as a result of fake electronic HIV tests conducted on its parents....My story began in 1985 when I finally gave in after a year of a friend’s pestering and visited a naturopath who tested me with his self-invented saliva testing 'diagnostic computer.' He called this 'bio-energy medicine' and announced that I was suffering from 'diabetes, tuberculosis, virus, bacteria and fungal infections and malfunctions of bodily organs, plus a host of other conditions.' Other alternative practitioners confirmed his cancer diagnoses and ‘cures’. From 1986 I became aware of a qualified naturopath using this therapist’s machine who was also diagnosing infections including malaria, toxoplasmosis, cancer, faulty heart valves and blood clots..."
Quack "Electrodiagnostic" Devices - Stephen Barrett, M.D. Unorthodox Techniques for the Diagnosis and Treatment of allergy, Asthma and Immune Disorders -- ASCIA (Australasian Society of Clinical Immunology and Allergy) Position Statement Use of unproven allergy tests is common in Australia and New Zealand. Despite advances in scientific knowledge about allergic disorders, 50-70 per cent of patients with allergic disease consult alternative practitioners yearly for diagnosis and treatment. ADR Energy Stimulators "Placing the disc directly over a part of your body affected by disease or, the corresponding acupuncture points, brings relief and promotes healing processes....[the disc is] a neutralizer of the untoward influence of electromagnetic fields on living organisms." 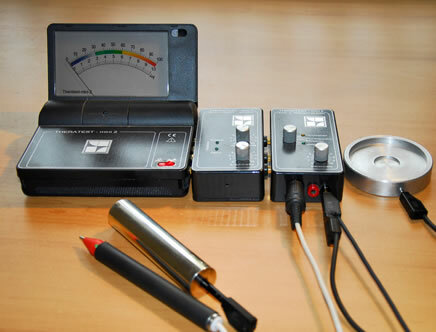 Advance Bio-Photon Analyzer "An advanced subtle energy instrument that...can make a self-tuned, custom isopathic remedy in less than 40 seconds...."
Baar Wet Cell Battery System "The Baar Wet Cell Battery System is designed to help enhance the body's natural healing tendencies. The unit generates a very, very low electrical flow in the body. Passing this current through various solutions enhances the benefits of the Baar Wet Cell Battery system. This system is said to tap into the healing current vibrational medicine researchers are discovering." It is also said to be pseudoscientific nonsense. 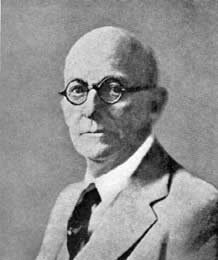 The use of a wet cell battery in New Age healing is the invention of Edgar Cayce, an early American celebrity psychic from the early 20th century. Cayce was best known for giving psychic readings on the sick, and developed a following of believers in psychic healing which still persists to this day. Virginia's Association for Research and Enlightenment, which claims tens of thousands of members, still promotes spiritual and psychic healing through methods developed by Cayce. One of these is the use of a wet cell battery. To use it, you mix chemicals in a bucket to create a weak battery. Next you mix the special "medicines", gold, silver, spirits, or iodine, in a secondary jar. [Barr sells solutions of gold, camphor, iodine, silver, iron and something he calls "GoldenSeal." ] A wire loops through these "medicines" and you apply the electrodes to your spine. You're supposed to do this for 30 minutes a day, and Cayce said months to years of daily application is required to get results. The claimed mechanism is "to introduce energy and medicinal vibrations directly into the body". There is no hypothesis behind the device suggesting how or why it might be useful. You can generally smell a quack by his disclaimer. Barr, for example, offers what he calls the Barr Wet Cell Multiple Sclerosis Research Kit for about $500. The buyer is warned: "This system is offered for those researching the Edgar Cayce readings that reference "M.S." We offer this system for personal research only and do not make medical claims for its application. This system is not intended to replace qualified medical care" (emphasis added). The Dynamizer. This was the invention of Dr. Albert Abrams (1863-1924), the "dean of twentieth century charlatans"* and the founder of radionics, the granddaddy of modern vibrational and subtle energy notions. The Dynamizer allegedly could transmit healthy vibrations to sick tissue or organs, thereby restoring them to a healthy state. The Grail Stone. "The grail stone has been gifted to mankind by the higher forces of the universe to assist in his spiritual transformation and awakening..." Aren't we the lucky ones! The Harmonizer will help "to retune those weaken [sic] disharmonious areas of the body commonly found over sites of illnesses." And pigs can fly. PAP-IMI (Pap-Ion Magnetic Inductor) by William Nelson.The device pulses the body with electromagnetic waves that allegedly repair damaged cells. How it is supposed to do this is anybody's guess. Rife's work lives on in the practice of Diane Spindler (Dr. Spindler to you. She has a Ph.D. in nutrition from the American Holistic College of Nutrition in Birmingham, Alabama! ), Renewal Enterprises (The Detox Box - MFG 1000 Micro Bio-Frequency Generator), Hulda Clark (the Zapper), and many others.